Meet the Zoo Team: Randy Johnson | Dallas ZooHoo! Not many people can say they enjoy their first cup of coffee in the morning while listening to a lion’s roar echo in the distance. But that’s how Randy Johnson’s day starts off. Randy’s been the horticulture manager at the Dallas Zoo for just over a year, and he’s made quite an impression. 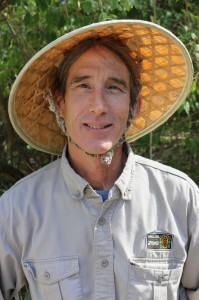 With a degree in Wildlife and Fisheries Sciences from Texas A&M, a job managing private estate gardens for just over three years in the Dallas area, and working as Director of Horticulture at Texas Discovery Gardens in Fair Park, Randy was more than qualified for the job of caring for the Zoo’s plant life. He also began his own consulting business, Randy Johnson Organics, where he grows and sells native Texas plants as well as other ecotypes throughout North Texas. To top it all off, he serves on the Board of Directors at Lakeland Community Garden in Dallas and is the current president of the Dallas chapter of the Native Plant Society of Texas. The man bleeds chlorophyll. Randy’s day-to-day responsibilities include “all things botanical.” He supervises eight people, and their work encompasses anything that emits oxygen. From the blades of grass on Picnic Ridge to the huge trees in ZooNorth and the shrubs of the Savanna, Randy and his team ensure that the Zoo’s plant life thrives, as well as making the park beautiful and shady for guests. “There are lots of challenges,” he says. “But my goal is to make the Zoo a 100% organic ecosystem.” One of the reasons Randy wanted to work here is his philosophy of strengthening the Zoo’s native fauna, while reducing its invasive plant species. One of his favorite things: creating habitats that make animals feel at home. “We owe it to them,” he says with conviction. “It’s our job to provide the best quality of life for these animals. An elephant can’t raise money [for conservation], but we can.” These creatures may not be in their native lands, but Randy and his crew make them think they are. One of Randy’s wildest experiences involved the time a massive tree collapsed into the flamingo pond. You’d think David Blaine was involved, from the way the entire staff cleaned up the mess and made it seem like it never happened. “It was awesome watching all these departments come together under this bad experience,” he said. That’s the thing about the Dallas Zoo. It’s not only full of hundreds of interesting animals … hundreds of talented and fascinating individuals like Randy work here, too. Randy’s presentation yesterday at the Pollinator PowWow in Austin was outstanding. Although I grew up in Dallas and still visit family in Dallas often, I had not considered an excursion to the Dallas Zoo in years. Randy’s enthusiasm for native plants, collecting seeds of local ecotypes, and his work at the zoo is contagious. I look to spending the day at the zoo soon. THANK YOU! Randy, you are a Godsend! As a Florida Master Naturalist, Osceola County (FL) Master Gardener, member of the Pine Lily Chapter of the Florida Native Plant Society, and Conservation Chair of the Kissimmee Valley Audubon, I applaud your great work taking care of the natural environment. All too often I feel that our information falls on deaf ears. But people ARE starting to wake up and smell the wildflowers, and what better place than a zoo? I heard Randy lecture in Waxahachie in August. I lost his email address. I found a horned lizard in my yard! It definitely had horns. I captured him and moved him to a different location because my cat was too interested in him. However, this little guy totally looked like a horned toad, but he was long and not round. I learn from National Geographic that there are about a dozen species of this lizard. This is my first time ever to find a long one, not round. I took a photo. If you give me an email address I can send you my photo. I want to know if you agree this is a horned lizard. thank you! Hi, Sherry. Please email us at info@dallaszoo.com. Thanks! Randy came to speak to our group, the Caddo Wildflower Chapter of NPSOT this week. We are located in upper Northeast Texas almost to Arkansas, Louisiana and Oklahoma. It is referred to as the four corners area. Randy was wonderful to hear and has such enthusiasm for nature and all things natural. We all enjoyed him so much that we want him back soon. I plan on taking my little grandson to the Dallas Zoo in the near future. I will be fun for both of us. Thanks, Randy.